Hundreds of protestors filled the streets Wednesday night in Anaheim after an off-duty LAPD officer fired his weapon during a confrontation with a 13-year old boy Tuesday. 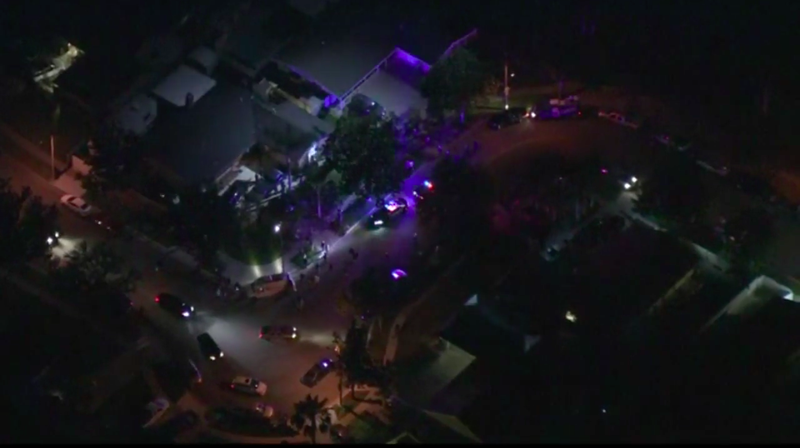 KTLA reports that the incident occurred Tuesday afternoon and “began over ongoing issues with juveniles walking across the officer’s property,” according to a statement from the Anaheim police. The boy in question “is alleged to have threatened to shoot the off-duty officer,” but as KTLA notes, that is disputed in the cell phone footage of the incident as well as by the parents of the boy in question. KTLA first published a story about the incident Tuesday night, which led to the boy’s family contacting the police with their side of the story. The footage, shot in broad daylight, shows the officer holding the boy by the sweatshirt as a group of teens gather to watch. “They’re grabbing a minor,” a girl says, as the boy in question protests. Two teenaged bystanders attempt to tackle the man. After a brief tussle, the man discharges his weapon and the crowd disperses. The boy again said he told the officer he was going to “sue him,” not “shoot” him. Protests began Wednesday night at the intersection near where the incident took place, calling for charges to be filed against the officer in question. CBS Los Angeles reports that while police in riot gear gathered at the scene, as of 9 p.m. PST, no arrests had been made. The two boys involved in the altercation were arrested and later released, but the officer was not. He has been placed on administrative leave while the Anaheim police conduct an internal investigation.